Carlisle boss Keith Curle has said any players found to have been out until 04:00 GMT less than two days before a match will face disciplinary action. The Cumbrians beat Morecambe 1-0 on Boxing Day, but then went on to lose 3-0 at home to York on Sunday. It is understood that up to seven players were seen out in Carlisle in the early hours of Saturday but it is not known if any were drinking alcohol. "It's very disappointing and I'll deal with it," Curle told BBC Radio Cumbria. "Everyone will want to see what my reaction will be. Will there be disciplinary action towards the players? 100% because it is unacceptable and I feel let down. "I will deal with it in the changing room in front of all the players because that is where I do my business and everyone will be exposed. "It's a lack of professionalism and they must face the consequences, learn from it and move on. People make mistakes." 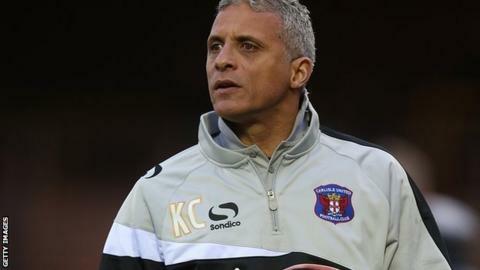 Former England defender Curle, 51, was appointed Carlisle boss in September and has guided the club off the bottom of League Two. Prior to their defeat by the Minstermen on Sunday, they had recorded back-to-back victories for just the second time this season, but will now travel to Newport on Saturday just two points clear of the relegation zone.